Well, hello. It's nice that you've been thinking of us. Yes. We know...we've been thinking of you too. What have we been doing? That's hard to say...when's the last time we talked? Yeah. I can't remember either. But it's ok. You are the kind of friends we can just start chatting with again like no time has gone by. Oh...we also decided to talk about smart phone education for you kids and when should you start it. Specifically, if you don't have a landline, make sure your kids know how to use a smart phone to call someone. This summer is full of travel (work and family), so we are having a haphazard recording schedule with the Dads. We appreciate your patience and hope you stick with us. This week we had plans to discuss the importance of alternate plans, but then Disaster Joe went on a rant about appliances. Luckily, he highlighted the need to have alternate plans for appliance shopping as well. Make sure to give the #SummerOfDad a go and let us know what's going on. You read that right! This week, the Dads had the great privilege to chat with two of Arlington County Fire Department's amazing Officers; Captain Sarah and Lieutenant Cheryl. 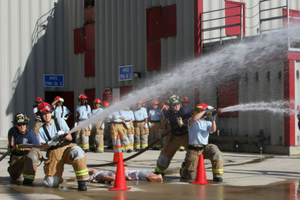 We heard about Camp Heat, a great summer camp that the ACFD puts on for girls ages 15-18 and with 7 daughters in the Disaster Dad family, we wanted to chat about it. I mean, how couldn't we....a free summer camp that involves fire? A no brainer. We really appreciated the time that Sarah and Cheryl took out of their evening to discuss the camp and that they put up with our shenanigans. If your household has a young girl that may be interested in the fire service....you can't go wrong with a fun summer camp. First: If you haven't gotten a flu shot...GET ONE! Second: Disaster Dan was awesomer than usual and had the brilliant that we should ask a smart person about the flu and how it impacts our kids (and the rest of us). So, we got to chat with Dr. Crystal Sparling, MD, MPH, FAAP. She's a pediatrician at Scissortail Pediatrics in Blanchard, OK. She's awesome and was very patient with the questions that Disaster Joe had. Listen to the episode, ask your pediatrician questions, and GET YOUR FLU SHOT. Listen to us chat about our time off and the little ballistic missile issue in Hawaii. Enjoy! This episode, the Dads review the second greatest Christmas movie on the market and look at it from the perspective of insurance and what Clark's bonus check really would have gone to. We were happy to welcome Disaster Joe back and appreciated his input. We also issue the #BlessingChallenge and we'd love to hear your stories and how your blessing went over. In this episode, the Dads have grand plans to discuss the Great Shakeout and use Disaster Erik's recent quinquennial physical as a reminder to take your health seriously. In typical Disaster Dad fashion, we were easily derailed and ended up talking about our days working the Marine Corps Marathon and when we should let our kids watch the formative movies of our youth. Worth listening to until the end. The very end. Following the domestic terrorist attack in Las Vegas, the Dads have grand plans to discuss how to talk to our kids about these attacks, but we easily (predictably?) go off on a tangent. We still have a great conversation, just not about what we planned to discuss. We round out the chat with an armchair review of the recent #Army10Miler and how it became the #ArmyFunRun. We were missing Disaster Joe, but that meant we were 100% beard strong.